The Pendre Longbarn in Pontrhydygroes, near Ystrad Meurig, Cardigan sleeps 6 people. 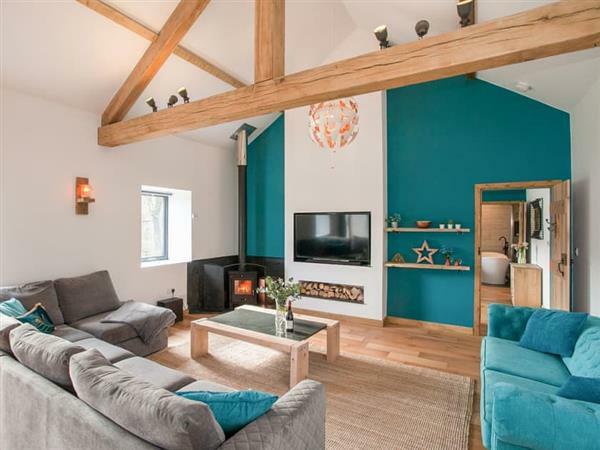 The Pendre Longbarn near Ystrad is a detached property which is a stunning example of a Welsh long barn and sits within the Hafod Forestry Commission Estate; occuping about 500 acres of the Ystwyth Valley. The estate was designed in the late 18th century and although the original mansion is gone, the historic walks network has been restored to allow you to enjoy this wonderful landscape. The owners have lovingly restored this property and created something truly luxurious. It’s all on one level and so much detail has gone into it, from the fixtures and fittings to the lighting and soft furnishings. The large open plan living, dining and kitchen area leads directly to the large garden via bi-fold doors, out onto the decked terrace with a fire-pit and barbecue. The master bedroom has a handmade feature king-size bed and a huge en-suite bathroom with double ended free standing bath, twin basins and a walk-in wet-room with special light effect to tell you when the water is warm! There are two further bedrooms, each with their own special lighting effects, the twin (with zip and link beds) has a ‘cosmic’ ceiling and the king-size bedroom has romantic, twinkly drapes around the bed. A ‘Jack and Jill’ family bathroom can be accessed from the king-size bedroom or from the hallway and has an eye catching copper sink set within an oak barrel. There is also an additional cloakroom with toilet. Access to the property is via an unmade stone road which is unlit. The views are amazing and you’ll probably while away many an hour watching the variety of visiting birds and often see red kites and buzzards circling overhead. From the doorstep of the barn, the estate can be explored on foot (there are five way-marked walks of varying length and difficulty), where there are streams, waterfalls and rustic bridges to discover. It provides an excellent base for exploring and taking part in activities such as canoeing, mountain biking, horse riding and walking, or just relaxing in a ‘get away from it all’ location. Nearby attractions include Devils Bridge, first built by monks in the 11th century and from where you can take the Vale of Rheidol steam train that meanders through the valley to the seaside town of Aberystwyth, and the Silver Mountain Experience, an 18th-century silver-rich lead mine. A 30-minute drive will bring you to the attractive Ceredigion coastline with an array of beaches and coastal towns and villages. The Pendre Longbarn is a unique property in an idyllic spot so come and see for yourself! The beach is 15 miles from The Pendre Longbarn near Ystrad. With the shop, pub and restaurant 2 miles from The Pendre Longbarn. Open plan living space: With wooden floors and bi-folding doors leading to garden. Living area: With wood burner and 55’’ Smart TV. Kitchen area: With double electric oven, induction hob, American-style fridge/freezer, dishwasher and wooden floor. Bedroom 1: With king-size bed and en-suite shower over bath, and toilet (also accessed from hallway). Bedroom 2: With king-size bed, TV and en-suite wet room with double-ended bath, shower and toilet. Oil underfloor central heating, electricity, bed linen, towels and Wi-Fi included. Initial fuel for wood burner included. Travel cot and highchair available on request. Welcome pack. Large garden with decked area and fire pit. Outdoor table tennis. Bike store. Private parking for 4 cars. No smoking. Holidays at The Pendre Longbarn run from Monday to Monday. Pets allowed at The Pendre Longbarn. For a better idea of where The Pendre Longbarn is, you can see The Pendre Longbarn on the map below. The Pendre Longbarn is in Dyfed; should you be on the lookout for a special offer, you can find all the special offers in Dyfed. It's always worth checking to see what is on offer at the moment. Do you want to holiday near The Pendre Longbarn (UK10351), you can see other cottages within 25 miles of The Pendre Longbarn; have a look to find your perfect holiday location.